It was another unconvincing performance from Manchester United on Wednesday night as they stuttered to a 2-2 draw with Arsenal. With rumours of another row with Paul Pogba, Jose Mourinho promptly named his club’s record signing on the bench, along with other big names like Romelu Lukaku. To sum things up at United right now, the combined cost of the players on the bench was actually higher than the XI he put out against the Gunners. Unsurprisingly, they again didn’t play well and were lucky to capitalise on one nightmare defensive error from Arsenal’s Sead Kolasinac as they lost concentration moments after scoring themselves. United fans won’t have gone home happy with what they saw, and things need to change as the team remains 8th in the league, slipping further and further from a top four spot, and still in negative goal difference after 15 matches. Mourinho needs to settle on his best XI. This is admittedly harder when injuries have been as bad as they’ve been, but at least allow players to get some rhythm going, allow partnerships to form, even if it takes time. Why the lack of patience awarded to the likes of Eric Bailly and Fred? Why the constant moving midfielders into defence? And what happened to Juan Mata in a number ten role that worked so well in impressive big-game away performances against Chelsea and Juventus? Jose, you’re not managing Stoke, these are mostly pretty good players, and you only need to pick eleven of them. Where to start with this? From the almost weekly rumoured rows with Paul Pogba behind the scenes to the infamous interview referring to several players as spoilt young boys – enough is enough. One former United manager, Sir Alex Ferguson (he was pretty successful, I hear) made his name by adapting to the times. This group of players is not and never will be John Terry and Frank Lampard circa 2004. Adjust your man-management methods or kiss goodbye to your status as an elite manager. The Daily Mirror are among the sources claiming David de Gea wants to become the club’s highest earner, along with Alexis Sanchez, to stay at United. Let’s be honest, if you can somehow justify putting Sanchez on that kind of money, you could probably justify paying De Gea about quadruple that, and, you know, that’s not even what he’s asking. Quite simply, the Spanish shot-stopper is the only truly world class performer in this team living up to his potential right now. Lose him, and United will be set back another five years or more. Replacing him would cost an absolute fortune and there’s just no guarantee that even someone like Jan Oblak or Gianluigi Donnarumma would be the same. And while we’re on De Gea’s contract, didn’t this whole mess start with Alexis Sanchez? It never seemed clear why the Chilean was signed in the first place. The style of football is wrong, he’s going to turn 30 soon and has played a hell of a lot of football at the highest level for the last decade, his wages are astronomical and will no doubt have unsettled others at the club (like De Gea, as mentioned above), and he’s only slowed down the progress of top young players like Anthony Martial and Marcus Rashford. It’s not easy to admit to a mistake of this magnitude, but it’s the only option now. Get rid as soon as possible. There’s been some talk about this happening and it really is a crucial step in the modernisation of Manchester United. According to the Evening Standard, there’s some suggestion that the club have had to assure Mourinho he won’t have any appointment ‘forced’ upon him. It’s certainly easy to imagine the Portuguese may not be keen on delegating, but it looks badly needed. 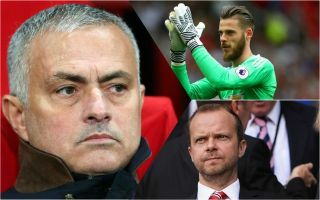 United can’t have another transfer window of disagreements – with Mourinho wanting proven, experienced pros like Willian, Ivan Perisic and Toby Alderweireld while Ed Woodward wants more long-term thinking. CaughtOffside understands this was a big problem in the summer, leading to disagreements over a number of transfer targets, and if the end result is that defence is just left as it is, then that’s no good for anyone. Get a football specialist in who knows more than Woodward, but who can also bridge the gap between the executive vice-chairman and manager, and then sort out that centre-back signing ASAP.